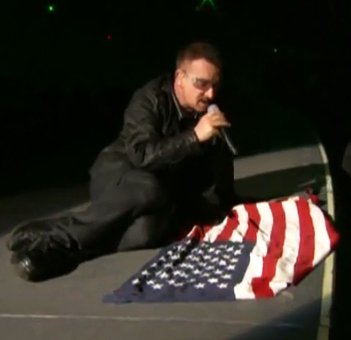 Looking from and glued to my laptop's flawless high tech stream of DSL jettisoned podcast last night, U2's Los Angeles concert in Pasadena's Rose Bowl to 96,000 was a spectacular event befitting of all the technology, sponsorship, globalism, slowly cooked glossy leftism in need of the American flag as well as BlackBerry and YouTube. 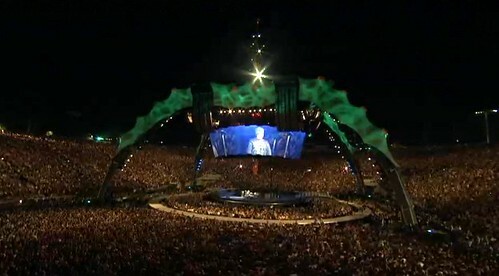 The long ago sold out tickets of the concert was only part of it. It didn't stop over 7 million and growing views YouTube had in less than few hours. This concert will definitely will go down to the archives of Rock's web presence. I have already added it to my favorites list symbolized with a heart sign. It is an impressive show of U2's ascend to critical mass audiences as the group has come long way since their planned chaos on a Los Angeles rooftop in the late eighties. The theme: “What time is it in the World?,” is fittingly appropriate to ask in this digitally connected age U2 so well familiar with. The musical U2 is one of those bands who found their sound early on and it was so pungent and beat was always at full communication with poetics of Irish culture, texture, activist political message, bad boyism and with the directness of their lyrical lines. Add to that, simple compilation of rock instruments played by the original members flawlessly and in a hypnotic manner. Add to that, is Bono's fine sand voice equivalent of several instruments all masterfully timed. We are talking about a band knowing how to read ballads into their brand of music and if that is not enough, they are calling the commander reading from international space station. Production wise, the stage theatrics and sound were beautiful and intricate. It feeds on the transformative concept as it expands and subtracts visually and conceptually with lights, media and narrations. 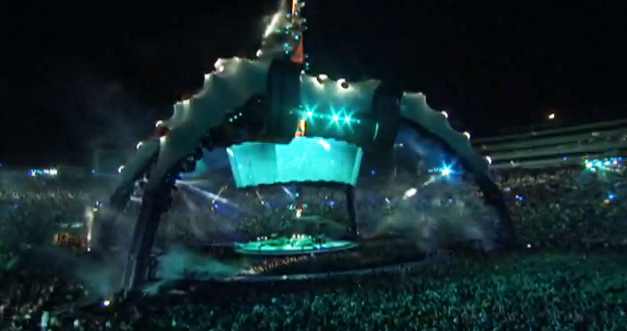 A smart marketing idea driven layout, an outer stage itself circles around the center stage (360 degree) connected by bridges allowing full round stadium seating and artist interaction. Over that is the four legged and multi functional claw creature / spacealienship reminding the all familiar LAX theme restaurant. These days musical talent is just the part of the show. A band leader must also be the captain of this spaceship with hundreds of people behind the scenes making the enterprise go boldly without glitches. 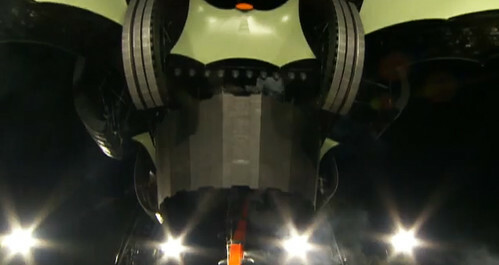 The production makes the full use of the media architecture. Even the spontaneous moments look composed with this band and I don't know if this is a requirement from astronomically well paying audience making full use of their cell phones and becoming individual stations, also broadcasting to their friends, families and cyberspace, demanding and getting full blown industry professionalism. Whoever is behind the scenes here as important but it is the immediate fans in the stadium and people like me watching it at home, who will politicize and make this concert memorable. 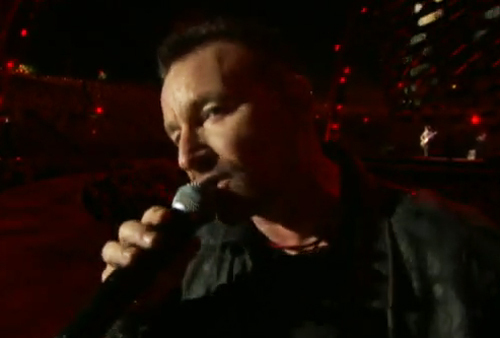 Bono thanks us home audience at the end as well. If you will, the design of the show and its production incorporates anything from website architecture to software architecture to just architecture. It was fun and engaging. 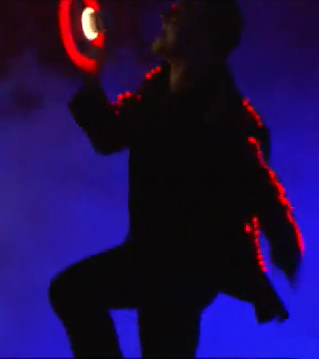 One of my favorite concert moment was Bono coming back after the first encore (there were two) as the electric space man. 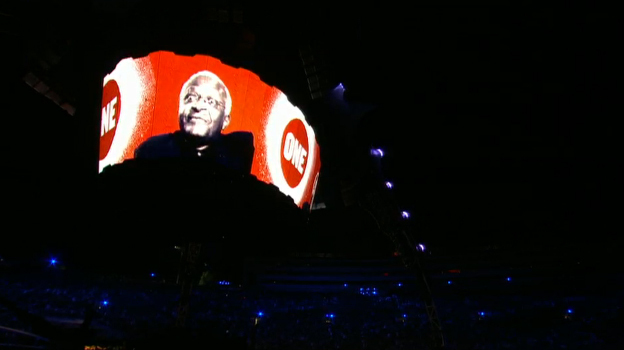 The political U2 is predictable... “Vamonos muchachitas, Hola... Viva Mexico” and the credibility of Bono's track record gets you Archbishop Desmond Tutu on digital screen sending much helpful AIDS medication and unity messages and U2 is powerful enough to send political requests to Iran and Burma via the co-operation of Amnesty International. Bono doesn't need to be anybody but himself, nevertheless, on stage he describes himself as somewhere between Arnold Schwarzenegger and Danny de Vito with a touch of Dennis Hopper. 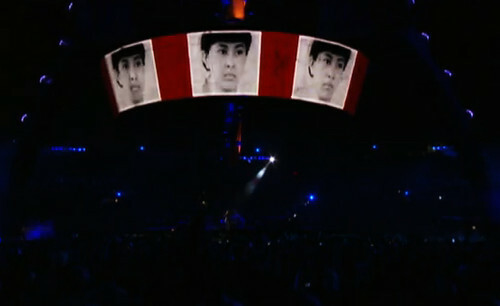 He is a better messenger and U2 is a giant facilitating platform as the brand. All this is fine except, we don't know how much of it is going to weld one of the sponsors “Honda” to our stream of conscience to everyday corporate paycheck to corporate paycheck kind of lives which Bono fails to address. This is a dangerous place to fall for otherwise well meaning musicians and well meaning and downloading audiences. I understand every penny and every action counts if it is saving one life or adding one more better human condition in the world. Bono himself most willingly puts himself into that category, like many other celebrities, impacting goodwill and benevolence. 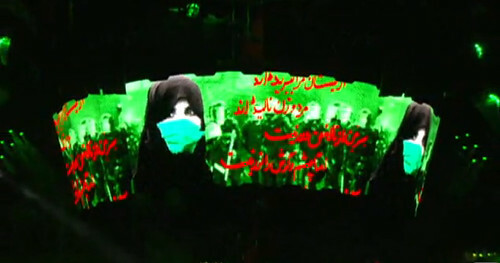 Yes, part of him wants to riot, but he is surrounded by enough sponsors that he does suppress that part of him. Then he runs into murky seas of contradictions. Not to worry, in fact his strength comes from those contradictions. Bono as the band's leader has gained respect not for his political views first, but because U2 is a great band and their music is highly profitable. They know how to carry their music and that is the highest level a rock band can ever achieve. 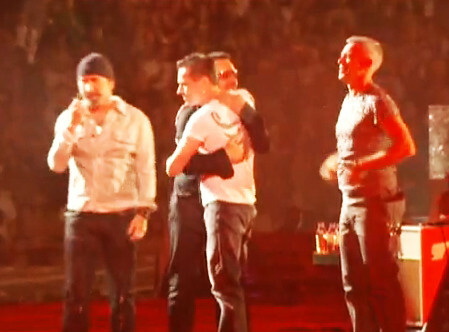 The band members Edge, Bono, Larry Mullen, Jr. and Adam Clayton hugging each other after a stellar performance is a show of that common ground solidarity in itself. After all they are a band and middle school friends from Dublin. In the light of all going on, “What time is it in the world, where are we going?” seems to be a timely critical question we must ask ourselves. Powered by that, U2 and this concert exceeds any normative ticket.